On this episode the guys talk about the Saddle Ridge Hoard that was found in Northern California and all the odd happenings that surround that hoard... Including Adrian's $40 Hoard. You don't want to miss this great episode and all the crazy info behind the now infamous Saddle Ridge Hoard. Sometimes figuring out the price of your coin is more than half the battle. There are many tools out there for you to use to price these coins and it is just a matter of knowing how to use them or what to look for. In this podcast Raymond Bullish Bryant and Andy the Elder Boorman discuss pricing coins. In episode 17 the Super Coin Bros. Talk about a recent flyer one of them received after signing up to receive one free ounce of silver. From the flyer pushing buyers away from Numismatics with some terrible tactics. Also find out what obsession Adrian "none betta" Chacon has with Taylor Swift. In episode 16 the Super Coin Bros. take some time to discuss the coin grading scale and some of the off the wall designations given by NGC and PCGS like Plus and Star and what they mean. Also, what is CAC and PQ and why are they important! All while uncovering that Adrian may have issues reading Ray's show schedule. You can check out the sites mentioned in this podcast here. To enter the Coins For Christmas Giveaway!! Continuing the series on historical hoards in the world of coin collecting the Super Coin Bros dig into the GSA hoard which contained more than 3 million Morgan dollars and was 85% Carson City Dollars. In this short episode you can learn what the GSA hoard is and how the coins were dispersed into public and they discuss a few of the GSA dollars that mysteriously went missing. Starting a new series giving new collectors and seasoned ones alike a touch of coin collecting history with facts that you may not have known about some of your favorite hoards that have been found over the years. The Super Coin Brothers started this series with the Redfield Hoard. You may not know some of the quirky facts behind this interesting coin hoard. Check out Episode 14 and find out some of the interesting facts behind Lavere Redfield. Knowing that there are common myths that surround coin collecting and investing, we took a little while to talk about 8 of the most common myths surrounding Coin Collecting. We discussed topics like population reports and why they might not be %100 reliable. With so many outlets for purchasing coins it is easy to caught up in a less than stellar purchasing situation without knowing. Unfortunately today there are more people that get ripped off or scammed by magazine publications or "Reputable" TV dealers. Stop for just a second and ask yourself; Would you just purchase a bottle of ketchup with a $50 price tag on it because it is in a "Reputable" Magazine or because it is featured as the "Deal of the day" on a TV show? I would hope the answer is no. We are going to take some time to discuss the things we constantly see happening to everyday folks like you and I and how you can avoid getting taken advantage of and some of the tools that you have available to you that you may not be aware of. Raymond Bullish Bryant talks about the all so common question. “What should I buy just in case the monetary system crashes?” We see a lot of people that stick to only US Government coinage whether it be %90 silver pre 1964 coins or Silver Eagles and Raymond give his “opinion” and explanation as to why he has the opinions he does. Listen in to find out why Raymond feels that protecting yourself against the US monetary systems crashing with a coin that says $1 on it is not his recommendation. Also, how can you buy 1200 Chickens! Raymond “Bullish” Bryant sits with Adrian “none betta” Chacon and gives us his insights on why dollar averaging is so important and why he feels he should have started dollar averaging and putting a portion of his money made into silver. Raymond will demonstrate how dollar averaging could have made him a profit of over four thousand dollars. From hoarding lunch money to selling lemonade, money was made but it was also spent and now we take a deeper look at how the money could have been utilized to produce more money. We had the opportunity to talk with Mason Amos, the ex manager of Sahara Coins about many different topics including where to get started when it comes to coins and what types of coins he feel will have the best return on investment. Mason has a wealth of knowledge and has been involved with the coin industry for years this is a great opportunity to pick up some quick tips. Episode 6 with Andrew “Money Man” McDonald touches subjects like Manipulation of the current markets and why Guns, Ammunition and bullion are all very very important. Also, purchasing fractional silver and gold is more important than you may believe, If you need to be on the move quickly grabbing some %90 silver may be your best bet. 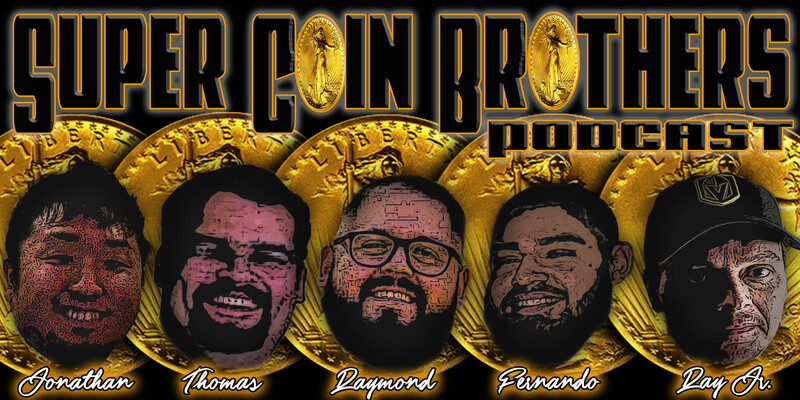 Jake "Moscow" Coronado sat down with me today to talk a little bit about how he became a Super Coin Brother as well as other very important topics in today's market, from where the markets are at right now and what some of the causes may be. We also take a in depth look at the types of items Jake enjoys including guns, ammunition and bullion. Great knowledge from a great Super Coin Brother!! Episode 3 with Jason “The Chili Peppa” Coronado hits on many different areas of collecting, and investing in Bullion and Coins all while learning that Jason learned how to speak Spanish in Canada… Yep I said Canada. With the market fluctuations and metals the way they are there may be another avenue to pursue when putting money into coins that can bring home the dough. Find out what those are! In this episode of Super Coin Bros I (Raymond "Bullish" Bryant) Sit down with Adrian "None Betta" Chacon to talk about the current market, which we all know is all over the place and definitely not a predictable being at this point. Some of the great coins and items we have in the store as well as the new trend here at Sahara Coins, wearing sunglasses indoors... This is the first episode of Super Coin Bros and you can get a taste of what this show will be about. A bunch of friends that love to give eachother a hard time while enjoying what we do. Bullion, Numismatics, football and much much more. Copyright 2014 Raymond Bryant/Supercoinbros. All rights reserved.